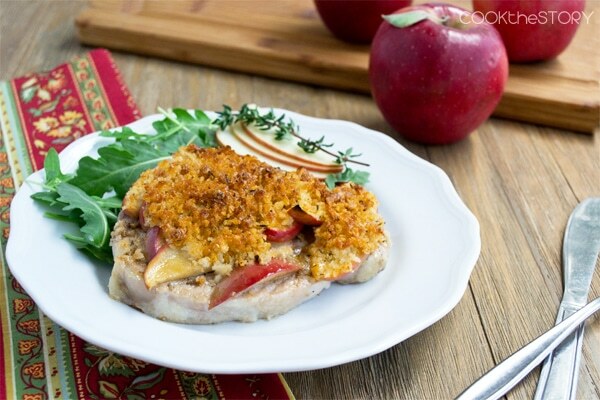 These easy Baked Pork Chops go into the oven with apples, maple and a crunchy cheddar and breadcrumb crust for a quick dinner that’s perfect for fall and winter weeknights but is special enough (and delicious enough!) to make for guests too. This recipe is sponsored by the New York Apple Growers Association. Pork and apples are a well-known flavor combination that goes back at last as far as ancient Rome (see here). When I realized how old that pairing is I decided to find out why. Why have generations upon generations of people put pork and apples together over and over and over again? According to The Old Foodie, it may be because pigs often grazed in apple orchards and then ate fallen apples. This may have subtly flavored the meat making it a great match. Or it could be because livestock was usually culled in the fall, in preparation for the winter months ahead. Fall is also when the apple harvest took place. Apples and pork would have been abundant at the same time and might have been paired together for that reason. Or, and this is what I think, pork and apple just have a natural flavor affinity that has been easy for people to recognize over the centuries. According to Legacy Pork, this flavor affinity id due to the acidity of apples which cuts through the fatty flavors of the pork. This also explains why sour fruits like rhubarb and sauces with vinegar or citrus (mmmmmm…Cumberland Sauce. It’s a British classic and one of my husband’s favorites) are much-loved with pork. Whatever the reason, I’m happy to follow the tradition and pair apples with pork whenever I get the chance. Like with today’s Baked Pork Chops with Apples, Cheddar and Maple. 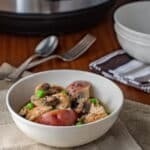 This pork chop and apple recipe uses a sweet crunchy apple that can stand up to a bit of cooking, like the SnapDragon, a new apple from The New York Apple Growers Association. These apples are available in the North Eastern US right now. Here’s where you can find them. 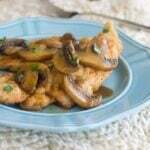 This is a quick and easy pork chop recipe. You set your pork chops on a pan. Mix together apple slices with maple syrup and cider vinegar and pile them onto the chops. Then you mix together some breadcrumbs and cheddar. Sprinkle the crumbs over the apples and bake. The top gets crunchy and the pork is tender with sweet apple and maple flavor. So good. With every bite you’ll agree that generations of cooks were not wrong. 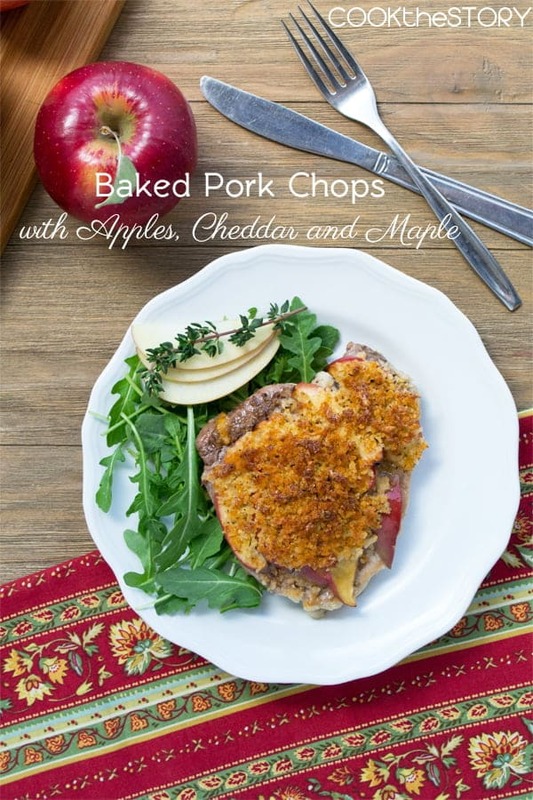 And now, here’s my Baked Pork Chops with Apples, Cheddar and Maple recipe. 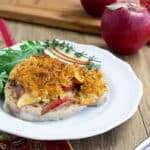 These easy Baked Pork Chops go into the oven with apples, maple and a crunchy cheddar and breadcrumb crust for a quick dinner that's perfect for fall and winter weeknights but is special enough (and delicious enough!) to make for guests too. Preheat the oven to 400ºF. Grease a large baking sheet with ½ teaspoon of olive oil. In a medium bowl combine the bread crumbs, cheese, thyme, ¼ teaspoon salt, ¼ teaspoon pepper and 2 teaspoons olive oil. Use fingers to rub ingredients together until the bits of cheese are the size as the breadcrumbs. In a separate bowl combine apples, maple syrup, cider vinegar and ¼ teaspoon of salt. Sprinkle both sides of pork chops lightly with salt and pepper. Arrange on prepared baking sheet. Top each with ¼ of the apples in a single layer and then with ¼ of the breadcrumb mixture. Bake until crumbs are golden brown and pork chops are at desired doneness, 20-25 minutes. Disclosure: The New York Apple Growers Association hired me to develop recipes and photograph recipes for their new SnapDragon apple and to write about them on my blog and post about them on social media. All opinions are my own. I love pork chops. 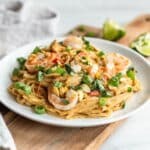 This a delish way to prepare them!